wild gas station shootout caught on camera! Its no longer a surprise in East St. Louis when this happens. But you know instead of fighting the ever increasing crime rate or fixing the roads the city has other pet projects in mind. Fox2 Reports that East St. Louis police are investigating a shootout at a 24-hour gas station. It happened just before 1 a.m. on Wednesday, September 12 at a gas station near the intersection of 18th Street and Missouri Avenue. Detective Ronald McClellan said surveillance video showed a red car parked in the parking lot. Then, a black vehicle could be seen backing into the parking space next to the red car. 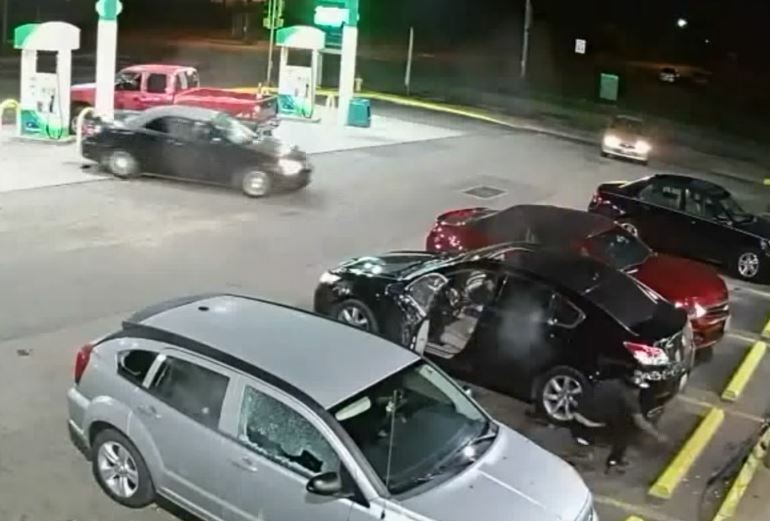 McClellan said it appears from the surveillance footage the suspect in the black car fired shots at the suspect in the red car, and the suspect in the red car quickly returned fire. It is unknown how many shots were fired. Several other people could be seen in the parking lot and inside the business. People inside the gas station could be seen ducking down aisles to shield themselves from the gunfire. No one was injured, but it is estimated the business suffered thousands of dollars in damage. McClellan said the suspects are local men who are known by police. Both are felons with an extensive criminal history. Police are not aware of any issues between the two suspects. Putin on the Rit… Trigger?